I love hearing about what careers characters in Harry Potter have — it's one of my favorite things J.K. Rowling has revealed since the conclusion of the Harry Potter series (well, the first conclusion, seeing as the story is continuing with Cursed Child ). According to Rowling, Harry becomes an Auror (of course), along with Ron, and Hermione works for the Department for the Regulation and Control of Magical Creatures before moving onto the Department of Magical Law Enforcement. Luna "is now traveling the world looking for various mad creatures," according to Rowling, and Ginny had a career in Quidditch with the Holyhead Harpies. The only thing I don't like about hearing all this interesting information about what my favorite characters did after school? I don't get to work these jobs. Not only would I have loved to attend Hogwarts, I would have loved to try out some of these enchanting careers. Traveling the world looking for magical creatures? Yes, please. Playing professional Quidditch? Sign me up (and please ignore my lack of hand-eye coordination). Working for a reformed Ministry of Magic as an Auror? Yes, yes, a thousand times yes. Sadly, since us HP fans can't actually hold these jobs, we have to make do in the Muggle world. Luckily, there actually are Harry Potter-centered jobs that you can have. For real. You may not be able to work for the Department of Magical Law Enforcement, but you can still have a completely enchanting (and Harry Potter-ish) job. Celestina Warbeck was the magical singing sorceress in the wizarding world, known for her song "A Cauldron Full of Hot, Strong Love." And if you've got enough drive, you can also start a Harry Potter-based band. This is an actual genre, if you weren't aware, and it's called "wrock" (wizard rock). Some wrock bands that can give you inspiration include The Blibbering Humdingers, The Butterbeer Experience, and Detention With Dolores. Honestly, it's almost worth starting a wrock band just to come up with an awesome name like that. Madam Pince wasn't exactly the most friendly librarian, and she definitely didn't help much when Harry needed to find certain books. But if you love reading, and you love Harry Potter, you can channel this for good and volunteer or work with the Accio Books campaign. Created by the Harry Potter Alliance, this campaign brings HP fans together for a great purpose: stocking a library in Masaka. According to the website, the Warner Bros. Studio Tour of London has several jobs for HP enthusiasts. Visitor hosts are "the frontline team, responsible for meeting, greeting and assisting our visitors upon arrival and again when they depart," and Interactors are "full of behind-the-scenes filmmaking secrets which they are eager to share." Retail Associates "help visitors find the perfect souvenir following their special day with us." LeakyCon, if you don't know, is the Harry Potter convention — a weekend of HP-centered magic for fans of the series. And you could actually do a presentation there. If you have a programming proposal, you can submit it here, and if accepted you could have your own panel at the convention. If you can't get enough of the Hogwarts Express, this may be the job for you: retail assistants at Platform 9 3/4 work in the shop, and work with taking pictures for HP fans. You may have seen those pictures of people jumping in the air with scarves, holding a trolley halfway through the wall at 9 3/4... you could be the one creating that magic. 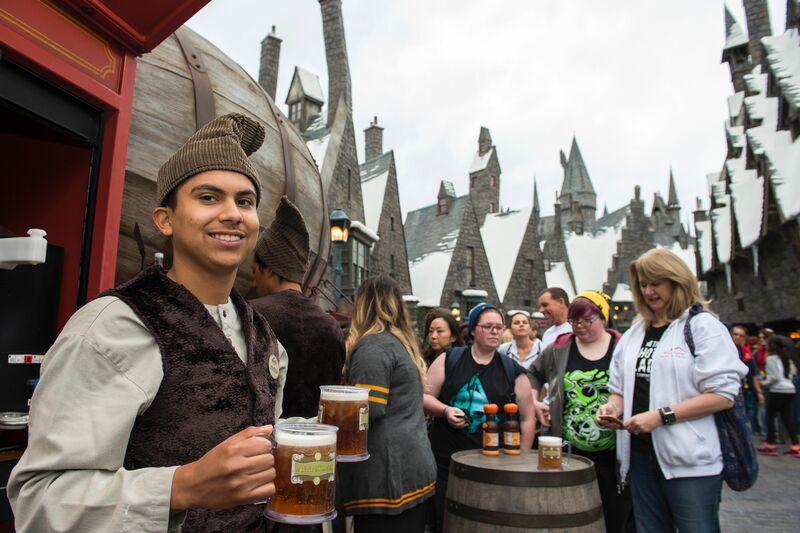 Now with two locations (Florida and California) the Universal Studios Wizarding World of Harry Potter has plenty of jobs available for HP enthusiasts — everything from operating HP rides to cooking food in the Three Broomsticks to performing in costume. From creating articles on blogs and websites to creating YouTube videos parodying HP, there are tons of ways to write about this magical series. Take Starkid for example: this group started with a hilarious parody of Harry Potter called A Very Potter Musical, and now? They have many other shows on YouTube, and you can even buy tickets to watch their shows live in Chicago. So if Harry Potter inspires you, you can find a way to work that magic into your life... because Hogwarts is everywhere, and Hogwarts is home.